A better copy of this post is available by clicking below. This version needs reformatting. For nearly forty years (that is, as of 1939) this story has given faithful service to the Young in Heart; and Time has been powerless to put its kindly philosophy out of fashion. To those of you who have been faithful to it in return --- and to the Young in Heart --- we dedicate this un-authorized, shoddy, and hastily thrown together travesty. It’ll kill 10 minutes for you. We hope you enjoy it. Or at least don’t want to break into my house and lynch me! Dorothy (Judy Garland) --- The Legend. You don’t have to be gay to love Judy! Scarecrow (Ray Bolger) --- Aside from his classic turn here, this great song and dance man is largely unknown to post-Boomers. Who do millenials think is a great dancer --- Lady Gaga? Tin Man (Jack Haley) --- Even less well-known today is this funny light leading man who stepped in and mercifully spared us a lifetime of watching Jed Clampett blow smoke out a funnel atop his head! Cowardly Lion (Bert Lahr) --- A great vaudevillian and comic actor and the only “Member of the Tribe” in the film. For your next version of The Hanukkah Song, Adam Sandler, belatedly take note already! Wizard of Oz (Frank Morgan) --- Jovial and avuncular with that one-of-a-kind voice, he actually played five different roles. Well, only two here; it’s just a dopey parody folks, not the actual movie! Wicked Witch of the West (Margaret Hamilton) --- Years later she morphed into Cora the Coffee Lady in a series of nostalgic commercials, always a welcome sight to Boomers and their elders. But I’m still not sure I’d drink any coffee she’d hand me! Glinda (Billie Burke) --- An unusual bit of casting, sort of like a contemporaneous version of Betty White in the part. Ms. Burke was a bit long in the tooth to play a "beautiful witch," but she pulled it off just fine with her charming voice and a battalion of makeup artists. Auntie Em (Clara Blandick) --- Perhaps the most iconic character in movie history whose face you can’t close your eyes and picture. Uncle Henry (Charley Grapewin) --- Perhaps the second most iconic character…. Munchkins (The Singer Midgets) --- Who the hell was Singer? What was his mysterious hold over the Munchkins? Was he the real life Wicked Witch of the West? The Flying Monkeys --- Over 700 real Flying Monkeys were imported from Borneo to Hollywood by famed naturalist Jack Hanna Sr. for three weeks of shooting at a cost to the studio of over $27,000 in live rats! Not to mention the handful of paternity suits. Hymie Moskowitz (Fred Armisen) --- I made him up! Whaddya goin’ do about it? Toto (Toto) --- Probably the only sane one in the bunch! We first see Dorothy, Toto in hand, as she runs towards the farmhouse where she lives with Auntie Em and Uncle Henry. At this point the movie is in black and white only, serving to represent how the dull windswept Kansas landscape resembles your own miserable boring little life. Dorothy: She isn't coming yet, Toto. Did she hurt you? She tried to, didn't she? Come on – we'll go tell Uncle Henry and Auntie Em. And then we’ll put it on Facebook! C’mon, Toto! Dorothy runs into the farmyard where, through the miracle of Foreshadowing, she encounters three of the farm’s hired hands. Dorothy: Oh, here you all are! Hunk, Zeke, Hickory: Miss Gulch is after Toto! What can I do!? Hunk: Dorothy, you have to use your head about Miss Gulch. Your head ain't made of straw, you know. It’s actually made of a gooey bulbous gray matter, floating in a gloppy viscous solution --- actually, straw’s a lot more pleasant! Zeke: Are you gonna let that old Gulch heifer try and buffalo ya? She ain't nothin' to be afraid of. Have a little courage, that's all. AHHHHHH!!! I broke a nail! Help! Help! Hickory: I’d use a little heart, Dorothy. Y’know, someday, they're going to erect a statue to me in this town! Auntie Em: (entering the scene) From what I’ve heard, Hickory, I’d avoid the using the word “erect” if I were you! And Dorothy, I heard all that about Miss Gulch. Stay away from her and find yourself some place where there isn’t any trouble! Hunk, Hickory, Zeke, and Auntie Em all depart, leaving Dorothy & Toto alone. Dorothy: Some place where there isn't any trouble. Where? Like the Korean Peninsula? Do you suppose there is such a place, Toto? There must be. It's far, far away, behind the moon, beyond the rain … okay, now a little to the left, a bit higher on the right ... we'll hang this thing yet .... that's it, perfect! There's a land that I heard of from some lame old random guy. And the dreams that you dare to dream tell the world "F* c k You!" And no creditor will never find me! Birds fly over the rainbow. Why then, oh why, can't I? If crappy little bluebirds fly, why oh why, can't I? (speaking) Well, folks, that was your first song parody and frankly, it wasn't that great. I promise you they'll get better, but like how much did you pay for all this? The scene shifts and Miss Gulch is seen riding her rickety little bicycle up to the farmhouse and knocking on the door, where she is greeted by Ward and June ... I mean, Uncle Henry and Auntie Em. Sorry, iconic character mix-up. Miss Gulch: I want to see you both. That little dog of Dorothy’s bit me! Uncle Henry: That poor feller! Think we should have his stomach pumped? Miss Gulch: No, you nincompoop! I’ve got a court order to take him to the sheriff to be destroyed. And if the sheriff won’t do it, I’ll get Deputy Fife! Dorothy: (rushing forward) Destroyed? That last joke is the only thing that should be destroyed! Auntie Em: We can't go against the law, Dorothy. Years ago, I fought the law…. and the law won. There, is that funnier? Dorothy: No, no, no! You both need better writers! And I won't let you take Toto! (to Miss Gulch) You go away, you wicked old witch! Uncle Henry: (to the audience) That’s a bit more Foreshadowing, folks. In case you haven't noticed, we're big on that here in Kansas. There's not much else to do. Dorothy turns away to her room, sobbing. Auntie Em: Almira Gulch, for twenty-three years I've been dying to tell you what I thought of you. And now... well, being a Christian woman … I can't say it! (pause) That’s why I brought my friend Hymie Moskowitz over today. Go ahead, Hymie, tell her what we think of her!! Hymie steps out from the corner of the room. Hymie: Actually, Emmy, I kind of like her. She seeing anybody? Auntie Em: Hymie! All the way from NYC for this! Incredulous at what he's hearing, Toto pushes his head out of Miss Gulch’s basket, looks around, sees his chance to escape, and goes for it! Thoroughly nauseated by Miss Gulch’s conversation, Toto runs back down the road and leaps through the window into Dorothy’s bedroom. Professor Marvel: Hello, young lady! What are you up to? No, wait, let me guess. You’re running away. Professor Marvel: Professor Marvel never guesses, he knows. Plus we’re here in the middle of T.S. Eliot’s The Wasteland; I hardly thought you were scouting locations for the next Judd Apatow movie! Dorothy: Can Toto and I go with you and see all the Crowned Heads of Europe? Professor Marvel: Well, I only get to see the crowned heads, not the whole bodies. That pretty much limits things to Marie Antoinette and Louis the XVI. Don’t hold your breath for Prince William and Kate Middleton! Professor Marvel leads Dorothy and Toto into his wagon to read what the future holds if the two join him in his travels by gazing into his Crystal Ball (which has nothing to do with the private parts of a well-known Jewish comedian; clean up your mind, sleazeball!) As Dorothy closes her eyes, Professor Marvel rummages through her basket. Professor Marvel: I see a woman wearing a polka-dot dress. She's care-worn. Dorothy: That must be my Auntie Em. What's she doing? Professor Marvel: Why she's crying. Someone has hurt her, someone she loves very much. What's this? She's putting her hand on her heart and dropping down on the bed! Dorothy: Oh no! What else? Professor Marvel: She seems to really love children, and …. she also has very, very thick lips! (incredulously) Each one of her lips is thicker than both of Mick Jagger’s! Dorothy: That’s not Auntie Em, you idiot, that’s Angelina Jolie! What were you doing, Marvel, rifling through my Us Magazine? Professor Marvel: Angelina Jolie? Oh,well, then the Auntie Em in my fantasy can put her polka-dot dress back on and skedaddle! Now not to be rude but ... you skedaddle too, kid! Dorothy and Toto leap up into the air (what else were they going to leap up into? A jar of Hellman's Mayonnaise?) and begin racing back toward the farm. Professor Marvel: (to his horse) Better get under cover, Sylvester, there's a storm blowin' up, a whopper! Poor little kid! I hope she gets home all right. Not that I offered to take her home or anything. Okay, let’s go watch HBO, Sylvester --- the new season of Curb is on! As Dorothy reaches the farm, a tornado is literally chewing up the scenery behind her. (It is not alone.) Auntie Em, Uncle Henry, Hunk, Hickory, and Zeke are frantically trying to get into the underground storm shelter, pushing each other out of the way like the Three Stooges! Zeke: It's a twister! It's a twister! Hickory: Hey, that’s a great game! Especially if we can get Dorothy and Auntie Em to play! Auntie Em: Dorothy, Dorothy, where are you? Damn, she owes me money! Uncle Henry: Ahh, she borrows from everyone. Even Toto! Uncle Henry slams the shelter door shut as if he just saw a whole life insurance salesperson coming up the walkway. Seconds later, Dorothy and Toto arrive. Dorothy: Auntie Em! Uncle Henry! Please let me in! There’s no HBO in the farmhouse and the new season of Curb is on! • Miss Gulch, madly pedaling her bicycle through the air, nightmarishly transforming before our eyes into a cackling witch with a pointed hat and cape on a zooming broomstick! Is it any wonder why to many of us Boomers this part of the film reminds us most of the 60's? Dorothy awakes and rises from her bed. Dorothy: Oh! That was cool, eh Toto? Let’s get some cotton candy, get back in line, and do it again! Toto regards Dorothy with a sort of “maybe I ought to get her to a specialist quick” look. Dorothy, holding Toto, walks outside the house and beholds a glorious candy land of joy, happiness, and sunshine! The film is now in full Eastman Color, emphasizing both how fabulous and miraculous things are in Oz and how lousy your own miserable boring little life is by comparison! Dorothy: Toto, I've a feeling we're not in Kansas anymore. We must be over the rainbow! Either that or in the United States the way Sarah Palin sees it! In a large blue bubble --- probably chewed and blown by Philadelphia Phillies manager Charlie Manuel --- a shimmering figure appears. Dorothy: I'm not a witch at all. I'm Dorothy Gale from Kansas. Glinda: (pointing to Toto) Oh. Well, is that the witch? Dorothy: Only to Michael Vick. Glinda: Well, I'm a little muddled. The Munchkins called me because a new witch has just dropped a house on the Wicked Witch of the East. And there's the house – and here you are – and that's all that's left of the Wicked Witch of the East. Dorothy: Now, I get it! Last November, you overdosed on Christine O’Donnell and you’ve got witches on the brain? Is this Delaware? Glinda: No, no, not at all! I am Glinda, the Good Witch of the North. Dorothy: I’ve never heard of a beautiful witch before. Although you’re played by actress Billie Burke who was already 25 years too old for the part and looking it big time in 1939 --- but, what the hell, the line’s in the script. Glinda: Only bad witches are ugly and …. what! Hey, what’s that crack supposed to mean? Dorothy: Oh, nothing … nothing… (begins whistling) Say, who are the Munchkins? Glinda: They’re the little people that inhabit this land. They’re named after a popular breakfast treat from a chain of coffee shops that will open about 50 years from now. Our idiot director Perry Block actually thinks the Dunkin' Donuts people are going to pay him something for that shameless plug! Dorothy: Well, being’s I’m their hero and they’ll probably want to kiss my hindquarters royally, what’s say we meet and greet: Those crazy Munchkins! Glinda: (singing) Come out, come out, wherever you are, and meet the young lady who fell from a star. Dorothy: Nice build up, Glinda! Glinda: (singing) She fell from a star, she’s the Witch-Killing Czar, and Kansas she says is the name of the star! From all around the Munchkins come out of their homes and out of hiding to meet Dorothy. There’s Munchkins to the right of her, Munchkins to the left of her, Munchkins to the …. Is that enough referencing for some cash payment, Dunkin' Donuts? No? Damn! Glinda: (singing) She’s a chick you should know. Or haven't you heard? When they kicked her out of Kansas, a miracle occurred. Dorothy: It really was no miracle, what happened was just this: (singing) The wind began to switch; the Witch was with her boyfriend Mitch; and suddenly her clothes Mitch started to unhitch. Just then the Witch - to satisfy an itch - said something ‘bout a broomstick, Oh, what a Wicked Witch! First Munchkin: And oh, what happened next was kitsch! All Munchkins: The Witch had on no stitch, as Mitch began to twitch. Then the house landed on Witch & Mitch who were lying in a ditch, Which ended this stealthy situation for the Wicked Witch. And it was no glitch ... that sleazing round with Mitch ... put an end to the Wicked Witch! Second Munchkin: (to Dorothy) We thank you very sweetly, for offing her so neatly. Third Munchkin: And to thank you more completely, on Twitter we’ll thank you tweetly! Glinda: Let the joyous news around us swarm –-- the wicked old witch has bought the farm! It "rhymes with witch!" Ding Dong, the rhymes with witch is dead! Ding Dong the merry-oh, Let’s get high, with lotsa blow! Get out your dough, the rhymes with witch is dead! Dorothy: Hey, they're pretty damn decent! Glinda: (whispering) They used to open for Liza Minelli. Now in a puff of smoke, another figure appears, dark, ugly, and menacing. Hymie Moskowitz would probably have the hots for her too.Wicked Witch: Who killed my sister? (pointing to Dorothy). Is it you? (then looks over at dead witch’s feet beneath the house.) Say, nice house, good construction, wood siding too. (to Dorothy) What are the schools like? You taking offers? Dorothy: (to Glinda) I thought you said she was dead! Glinda: That was her sister, the Wicked Witch of the East. This is the Wicked Witch of the West. She’s worse than the other one! Dorothy: Worse than the other one? Not that it’s important or anything, but seems to me that’s kind of significant information you left out before, sister! Glinda: What the heck. (to the Wicked Witch) Aren’t you forgetting something? The Ruby Slippers? Wicked Witch: Oh yeah, thanks, Glinda! You're a peach! The Wicked Witch approaches the Wicked Witch of the East’s feet and tries to secure her shoes. She screams in pain as she experiences what seems to be a terrific electric shock.Wicked Witch: AHHHHHHHH!!!!! I experienced a tweet from the vastly over-rated Twitter feed @ShitMyDadSays. It was totally unfunny!!! The Ruby Slippers now disappear from the Wicked Witch of the East’s shriveling feet and appear on Dorothy.Wicked Witch: Where are those slippers? My feet are freezing! Glinda: (pointing to Dorothy’s feet) There they are and there they’ll stay. Besides, they’re way too small for Dorothy’s clodhopper feet; she wouldn't be able to take them off for a foot massage from George Clooney. Dorothy: Hey! What’s that crack supposed to mean? Wicked Witch: (to Dorothy) Give me those slippers! Glinda: Hang on to them tight. They must be very powerful or she wouldn’t want them so much. Plus you can’t believe how much they go for in Bloomies! Wicked Witch: (to Glinda) Very well – I'll bide my time. (to Dorothy) And as for you, it's true I can't attend to you here and now as I'd like, but I'll get you, my pretty, and your little dog too! Uhh, what I mean is …. heh, heh, I’ll get you and Toto in my station wagon and take you right over to the Westminster Dog Show! Glinda: Begone, you have no powder here! Nor do you have any liquid detergent, so you can’t do your wash now. You’ll just have to hit the Laundromat later! Glinda: I’m afraid you’ve made quite a powerful enemy! At least it’s not Nucky Thompson from Boardwalk Empire! Dorothy: Now what do I do? Do you know how I can get back to Kansas, Glinda? You don’t even know how to find a good plastic surgeon! Glinda: That's true. I .... hey, what's that crack supposed to mean? Glinda: The only person who might know would be the great and wonderful Wizard of Oz himself. All the Munchkins bow reverently. It's almost as if Glinda had invoked the name of the one and only Chairman of the Board, Mr. Francis Albert Sinatra! Dorothy: The Wizard of Oz? Is he good or is he wicked? Glinda: Oh, very good; but he does have somewhat of a reputation for weed! They test him regularly now, shouldn’t be a problem. He lives in the Emerald City, a long journey from here. Dorothy: How do I get there? You got a limo for me or something? Glinda: No, you’re footin’ it, Cinderella. All you have to do is Follow the Yellow Brick Road. I just Mapquested it for you! Dorothy: Oh, super! Mapquest! Maybe I’ll get to the Wizard’s place in time for the birth of Justin Bieber! Glinda: The Munchkins will see you safely to the border. After that, you’re pretty much SOL! A Munchkin: (to Dorothy) Follow the Yellow Brick Road! Dorothy: Yeah, I got that. Second Munchkin: (to Dorothy) Follow the Yellow Brick Road! Dorothy: Dude, I’m not deaf! Third Munchkin: (to Dorothy) Follow the Yellow Brick Road! Dorothy: Cruisin' for a bruisin', Ding Dong? All the Munchkins: (singing) Follow the Yellow Brick Road! Follow the Yellow Brick Broad! Follow the, Follow the, Follow the, Follow the Yellow Brick Road! Dorothy: OMG, get me out of here! They’re driving me crazy! Of the positive whiz he whoz! Dorothy: Is that really a word -- whoz? Dorothy and Toto dance off down the Yellow Brick Road and on to meet…. Dorothy: Now which way do we go? Damn Mapquest! Scarecrow: Pardon me. (pointing) That way is a very nice way. 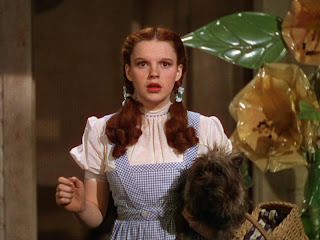 Dorothy: (to Toto) Who said that? Scarecrow: It's pleasant down that way too. (pointing) Of course, people do go both ways. Wait a minute, don’t take that wrong! Scarecrow: Yes I am, but I can’t be much help on directions --- of course more than Mapquest --- because I haven’t got a brain! Only straw. Scarecrow: I don't know. Some people without brains do an awful lot of talking, don't they? Ever watch Fox News? Scarecrow: Without a brain, I can't even scare a crow! They come from miles around just to eat my fields and laugh in my face. Even Russell Crowe, Sheryl Crow, and Counting Crows! Dorothy: That’s terrible! Umm, could you get me any autographs? Scarecrow: Dorothy, focus on the script, okay? Now, let’s start again! …. Oh, I'm a failure, because I haven't got a brain! Dorothy: Well, what would you do with a brain if you had one? BTW,Killjoy! And never be found lame! With status or a big name! Oh, the hot babes you’d be dinkin'! I’m a pompous strutting bore! A bon vivant of highest Haute Culture. Sell more copies than Old Yeller. The New York Times will sing my fame. Dorothy: That was wonderful! Say, can I go to swank parties with you, hang out with Jessica Simpson, and guzzle gin ‘til I pass out? Scarecrow: I could get you on the A-list faster than Charlie Sheen can trash a hotel room! But …. I don’t have a brain! Dorothy: I’m going to see the Wizard of Oz to get myself back to Kansas. Why don’t you traipse along with me? I’ll bet he could give you a brain. Scarecrow: What if he won’t give me one when we get there? Dorothy: Nah, I hear he’s a big stoner, he’ll be easy. Dorothy: No, to Havertown PA, genius! Of course, to Oz! Boy, you do need a brain! Scarecrow: Dorothy, is that really a word --- whoz? Dorothy, the Scarecrow, and Toto dance off down the Yellow Brick Road and on to meet …. Dorothy, the Scarecrow, and Toto are walking down the Yellow Brick Road when Dorothy stops and reaches to pick an apple from an apple tree. (Oh, boy, this is good!) Unexpectedly, the tree grabs the apple back and slaps her hand. Apple Tree: What’d’ ya think you’re doing? I’ve heard of tree hugging, but you better at least buy me dinner before taking liberties like that! Dorothy: We’ve been walking a long ways and I was hungry and ... did you say something? Apple Tree: (sarcastic) She was hungry! Don’t grab my apples, girly, unless you’re ready to make a serious commitment! Dorothy: Oh dear! I keep forgetting I’m not in Kansas! Scarecrow: (whispering) Here Dorothy, I’ll show you how to get apples! (to the Apple Tree) You know Roy Halladay just won the NL Cy Young, and you don’t even have a decent change up! Apple Tree: Are you trying to say I couldn’t get Ryan Howard to look at a third strike in the ninth inning of the final game of the NLCS? Scarecrow: No, I’m trying to say you couldn’t locate the strike zone on Brad Garrett! Apple Tree: Oh yeah! I’ve got a great fast ball and slider, and I’m not a bad hitter either! The Apple Tree begins throwing a varied assortment of apple pitches at Dorothy and the Scarecrow which they quickly collect. One fastapple --- clocked at 92 mph --- sails into the forest and when Dorothy goes to retrieve it she finds…. Dorothy: Why, it’s a man! A man made out of tin! Hmmm, I wonder if he …. (to audience) Hey, you’re going to judge me? The only other guy I’ve got here is made of straw! Tin Man: (almost inaudibly) Oil can! Oil can! Dorothy: Oil can? That means lubrication! Now, we’re talking! (to audience) Again, folks, walk a mile down the Yellow Brick Road in my shoes, then see what you think! Scarecrow: Here’s the oil can, Dorothy! Hey, don’t yank that out of my hand so fast! And squirt it all over his body, not just his ….. Dorothy! Tin Man: (coming to life) Oh, thank you, thank you! At last I can put down my.....hey, watch it! Y'know, the apple tree warned me about you! Dorothy: Sorry! How'd you get this way? Tin Man: About a year ago, I was chopping down a tree --- it's sort of an initiation they put you through when you join the Republican Party --- when it began to rain and I rusted solid. Dorothy: Well, you’re perfect now…. At least, I’m hoping so. Tin Man: Perfect? Bang on my chest! Go ahead, bang on it. Scarecrow: Huh, it sounds just like banging on Levi Johnston’s head. Tin Man: The tinsmith forgot to give me a heart. And that’s not all, he also forgot …. Dorothy: Not exactly what I wanted to hear! Tin Man: Let me tell you about it. Romcoms just make me fart. Wathing a sappy romantic show. Sweet Girl Voice: A reg'lar 12-plex Romeo! And dig Nora Ephron’s art. While watching When Harry Met Sally,If I only had a heart. Dorothy: Tin Man, Scarecrow and I are going to see the Wizard of Oz and you should come too. Bet he could give you a heart. And you could share tolls. Suddenly the Wicked Witch appears with a cackle on the rooftop of a nearby cabin! This appearance of the Wicked Witch is brought to you by Valvoline. Wicked Witch: Helping the little lady along are you, my fine gentlemen? Here Scarecrow, want to play ball? The Witch hurls a ball of fire at the Scarecrow, setting him aflame! Scarecrow: Sorry, Witch, this is a smoke-free forest! You know that! The Tin Man beats out the flames and the Witch vanishes, cackling away! Thank you, Valvoline! Scarecrow: I'm not afraid of her! (to Dorothy) I'll see you get safely to the Wizard now, whether I get a brain or not. Uhh, there will be a nominal charge. Tin Man: (to Dorothy) I'll see you reach the Wizard, whether I get a heart or not. Err, she cooks for us, right Scarecrow? Dorothy: Oh, you're the best friends anybody ever had. And it's funny, but I feel as if I'd known you all the time, but I couldn't have, could I? Scarecrow: (to audience) What is this called? Post Shadowing? Tin Man: (to audience) It isn't Foreshadowing, we left that back in Kansas. Any English majors out there? Dorothy: I guess it doesn't matter anyway. We know each other now, don't we? Tin Man: That's right, we do. To Oz? Dorothy, Scarecrow, and Tin Man: (singing) Oh, we're off to see the Wizard, the Wonderful Wizard of Oz. Tin Man: BTW, that's the stupidest word I've ever heard --- whoz! And it's not that funny either! End of Part I of Flying Monkeys in the Mist. Who needs Frank Baum with Perry in the world? I like your version so much more than that tired old thing I've seen a thousand times. In fact, I think you should produce this, and I volunteer to play the part of Glinda because the description of her is what I see in the mirror daily. Please consider a career in songwriting. These lyrics stick in my head. Like gum in my hair. That tired old thing you've seen a thousand times? Me. Brett, Thank you very much for the nice comment! I will try to live up to Kathy's kind recommendation! Umm, which Kathy are we talking about? As few women as I know, I guess I know a couple of Kathy's. Although one of them isn't talking to me and the other has lately been threatening legal action. Again, thanks! To Oz? To Oz!